On April 22, 2010, Robert Gagnon, a garbage truck driver with Investissement N&N McGraw in New Brunswick, left his truck to collect garbage on the opposite side of the road. He was hit by a half-ton truck and was thrown 150 feet into the ditch. He died instantly. Since 2003, Gagnon and three other waste collection workers have died from workplace injuries in New Brunswick — in an industry of about only 350 employees. Additionally, waste collection workers are three times more likely to be hurt on the job than the average worker in the province, according to WorkSafeNB. 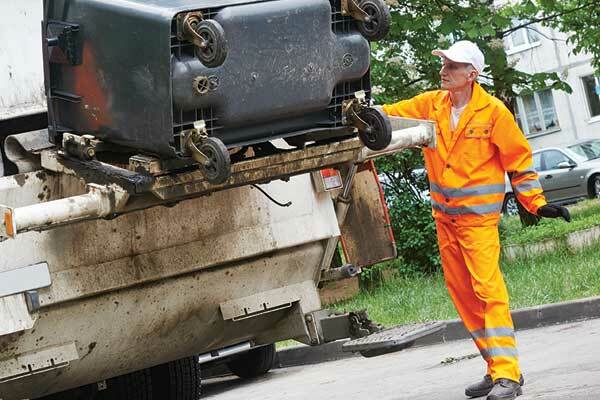 Waste collection is a much more dangerous job than most people realize, and health and safety managers need to be helping these workers stay safe on the road. According to Statistics Canada, 30,200 individuals across the country fall into the “public works maintenance equipment operators and related workers” category, which includes waste collection workers. One current issue waste collectors are facing is needles. Needles that are disposed of in a garbage bag can expose workers to bio hazards. In November 2016, two waste collectors in the Region of Durham in Ontario were stuck by used hypodermic needles. Objects that can cut skin and come in contact with bodily fluids, such as needles, syringes, EpiPens or lancets (also known as sharps) should never be disposed of in the garbage or recycling bin. A while back, a waste collection worker for Emterra Group, based in Surrey, B.C., picked up a whole bag of syringes that brushed along his leg, resulting in numerous slashes. As a result of that incident, the company put new protocols in place, including wearing long pants and using proper lifting techniques to avoid scraping the bags along the body, says Perry Boudreau, corporate director of health and safety at Emterra, which has 1,100 workers. If the worker believes the bag is unsafe, he is told to tag it, leave it at the curb and the company will make the appropriate authorities aware. Proper gloves should be worn to reduce needle pricks. Emterra waste collection workers must complete a blood-borne pathogen course and the company offers hepatitis vaccinations to its employees. Hazardous waste can be dangerous to waste collectors because it can be corrosive, flammable, poisonous or reactive. Items such bleach, batteries, kerosene, compact fluorescent light bulbs, gasoline, pool chemicals and propane tanks and cylinders should be taken to a hazardous waste depot, not put in the garbage, according to WorkSafeNB. If improper items are put into the trash, this can cause a fire in the truck and put the waste collectors at risk. “Their truck catches on fire and they want to be firemen. They want to protect the truck. ‘Oh my God, my truck.’ It’s garbage for heaven’s sake. It’s a piece of equipment. So we have a very serious training for our fire brigade (a designated person on each site) and the use of fire extinguishers,” says Deborah Fraser, national health and safety director at GFL Environmental, which has 7,000 employees and is headquartered in Vaughan, Ont. Waste collectors at GFL receive practical training where they are taught how to properly use a fire extinguisher, how to inspect it and when to call 911. When it comes to road safety, Petersen says the “single most important thing” is for waste collectors to not cross the street. Procedures should be in place so that the pickup of garbage is on the same side of the road as the truck. The public needs to realize their curbside and roadways are the workplaces of waste collectors, says Petersen, and they need to approach slowly and carefully when they see a garbage truck. “The trucks will make numerous stops along a particular route and you get people in behind that can’t see what’s around them, they get impatient, honk their horn and they can get fairly close (to the truck),” says Boudreau. In Boudreau’s analysis of truck drivers across industries, he has found those who are the most likely to be involved in a road accident are the ones who have been on the job for six months or less. The next most accident-prone group is individuals with 25 years or more of experience who have never had an accident before. “They think, ‘I have been doing this for 30 years. You weren’t even born yet and I was driving. What do you think you’re going to tell me?’” says Boudreau. Boudreau recalls an incident two years ago where a garbage truck rolled over. The driver had been working for 30 years without an accident or ticket and was “safe as can be.” When Boudreau was interviewing the driver, he said, “I never thought this would ever happen to me. Two seconds and I was over. It didn’t even cross my mind.” But no one is immune, Boudreau says. Lifting is another major hazard for waste collection workers. The average weight of a garbage bag is 16.5 pounds, with a maximum weight measured up to 86 pounds; however, this varies considerably, according to the Centre of Research Expertise for the Prevention of Musculoskeletal Disorders (CRE-MSD) at the University of Waterloo in Ontario. Heavy loads increase the risk of injury. The average worker does nine lifts per minute, with an average of two bags per lift, the centre found. Workers often toss the bags into the hopper instead of walking all the way to the truck, which can result in repetitive strain injury. Muscle strain — whether it be back, shoulder, hips, elbows or wrists — is the number 1 type of injury at Emterra, says Boudreau. “When you’re picking up anywhere from 1,000 to 1,500 houses a day, it can put a lot of wear and tear on your body if you’re not picking these bags up properly or if they’re too heavy,” he says. A high lifting frequency can also lead to fatigue. Workers at Emterra are told not to lift a bag that they are struggling to lift, which is often more than 50 pounds. They can ask the garbage truck driver to help them lift it, or they can tag it and leave it on the curb to be picked up later. Employers need to offer training for proper lifting techniques and provide a mechanical aid when possible, says Petersen. Some municipalities have bins, rather than bags, so workers can wheel the bin to the truck, which then lifts and empties the bin. Many trucks have a mechanical arm that reaches out to the curb to pick up the bin on its own. The number 1 hazard Fraser sees at GFL is slips, trips and falls. Workers are often not maintaining three points of contact when entering and leaving the truck, as they are trained to do. The workers who are the loaders are often hanging off the back of the truck and if that truck does not come to a complete stop, that worker is not supposed to jump on or off. Despite constant communication, tailgate meetings and training, violations do occur — something Fraser does not take lightly. After an extensive investigation and a root cause analysis, if it has been determined that a worker chose to make an unsafe decision that caused an incident, he will be disciplined. Weather poses a major risk for waste collection workers because they have to go out every day — rain, shine or snow. In the summer, heat stress in an issue; in the winter, cold stress is a concern. Driving conditions can change throughout a day, such as sun blinding the driver or rain making the roads slick. According to Boudreau, workers need to know what to do in all types of weather: Take breaks if they are overheated; wear appropriate rain gear; watch their footing on ice; and be aware of items blowing around in high winds. Even if the weather seems fine one day, remnants of poor weather the night or day before can cause problems. “Our trucks are driving on the street and what looks to them as a regular routine might not be because yesterday it was pouring rain; it’s pulling the wires down. They come around the corner where they have been clearing that area every week for three years and all of a sudden they have clipped the electrical wires and they’re down,” says Fraser. In an effort to protect waste collection workers from all these hazards, WorkSafeNB launched a dedicated two-year safety campaign in 2015 aimed at both employers and the public. To assist employers, the agency prepared discussion papers containing industry analyses, pre-use inspection checklists for machinery and equipment, employer orientation checklists and a safe waste collection guidebook for workers. The campaign also included focused compliance activities. To start, inspectors visited waste collection companies and looked for new employee orientation programs. “If you’re stepping into a job that’s been identified as a higher risk job, we’re assuming that you may not have much experience in that field or know what the hazards of the job are, so a well-constructed orientation and training program that speaks specifically to what are the key hazards is critically important,” says Petersen. Inspectors also focused on mobile equipment and employers’ facilities. WorkSafeNB recommended that as part of the tendering process, “significant consideration” be given to the bidding companies’ safety policies and procedures when deciding who should be awarded the contract, says Petersen. Historically, the tendering process often focused on the lowest bid without regard to safety, which sometimes steered service providers to compromise safety to remain cost-competitive. Aside from the typical hazards waste collection workers encounter, they also have to be trained on how to handle workplace violence and harassment. In June, a homeowner threatened to hurt one of Boudreau’s truck drivers in B.C. All workers receive violence and harassment training. They are required to notify Emterra right away if they are subjected to such behaviour, so the company can notify the municipality. Then, Emterra conducts an investigation and deals with the homeowners involved. Waste collectors encounter a lot of stress to get the job done on time. Trucks need to be off the road by a certain time and landfills are only open for so long, but unforeseeable factors such as bad weather, traffic delays or truck breakdowns can make it difficult to meet the deadline. GFL’s entire corporate safety team was trained in first-aid mental health awareness two years ago — but it was a bit of a tough sell. Now, Fraser and her safety team talk to the workforce a lot about mental health. They make sure workers know about all the resources at their disposal, such as the employee assistance program, and understand what to do if they are having a mental health problem. Since the vast majority of risks that waste collectors face come from the public and what they put in their garbage bags, educating the public on what they can do to keep these workers safe is very important. Municipalities regularly inform residents what they should and should not put in the garbage. Waste companies also get involved. For example, GFL rents out community centers and sets up in parking lots to hold educational fairs for the public. It’s important to remind them that not only are the men and women who pick up the garbage affected, but so are all the workers in the waste pipeline, such as landfill workers, recycling facility sorters and truck maintenance workers. But at the end of the day, the employer can only do so much to affect the public’s behaviour. Health and safety managers can also do their part to ensure the workers who pick up the garbage at their workplaces are safe. Waste containers must be in good condition and should be in easy-to-access locations. They should not be too heavy or unevenly distributed because that can cause awkward movements and potential injuries, says Petersen. And any items that are improperly disposed of can pose a risk to the cleaning staff. As they self-supervise for most of their shift, waste collection workers have to take personal responsibility for their safety, says Boudreau. Fraser says people need to get out of the mentality that safety professionals are the ones keeping them safe — because they’re not. Boudreau believes workers need to take safety beyond the walls of the workplace; otherwise it’s very hard to change beliefs and habits. “Safety is about when you wake up in the morning, you start the process in your mind on what the day’s going to be like, where you’re going to travel, what the weather’s going to be like, am I dressed appropriately? This is before you even get to work, and then when you get to work, doing things right,” he says. The numbers are still coming in on the WorkSafeNB waste collection safety campaign, but it was very well received by the industry and it continues to raise awareness of the hazards waste collectors face. In fact, the campaign won first place in the external communications campaign category of the American Association of State Compensation Insurance Funds’ 2017 Communications Awards. So, it looks like the two-year campaign — which would have ended in September — won’t be tossed to the curb quite yet. Here’s what you can do at home today to keep your garbage man safe. •Lighten the load. Always ensure each bag can be easily lifted with one hand. •Be careful. Take extra care when you see a garbage truck on the street. Approach slowly and carefully, watching for collectors. •Properly dispose of hazardous waste. Hazardous waste, such as bleach and pool chemicals, can be reactive or corrosive. Never put this in your garbage. •Ensure garbage is accessible. Always place bags and bins on level ground and as close to the street as possible. •Keep needles away. Never put needles or other medical waste in your garbage or recycling bins. Contact your pharmacy for proper disposal instructions. •Leave room in the bag or bin. Don’t overfill garbage bags. Leave enough free space at the top so the bag is easy to grab. Never overstuff bins. •Ensure yard waste is easy to handle. If using bags for leaves, wait until the organic mater is dry before bagging it.